Style, safety and flexible designs are the cornerstones of our WeatherMaster Window Systems. 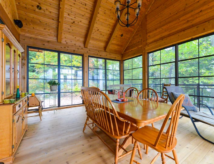 With a variety of window frame colors to choose from you have the versatility to color match your new Windows with the existing exterior of your home or cottage. WeatherMaster Windows and Door Systems combine the open feeling of a screen room and the comfort and convenience of an enclosed porch. Designed specifically for porches, screen enclosures and even gazebos, the WeatherMaster System is easily installed and can convert any of these areas into your favourite 2 or 3 Season room in the house. With a variety of configurations to choose from to suit your specific needs and custom applications, WeatherMaster windows and doors are an economical way to expand the functionality of any space while adding beauty and value to your home.